What would you would say? Within every workplace, there are off-limit topics. I’m not talking about politically incorrect issues or about legitimate wrongdoings. I’m talking about the ways people behave and interact every day. The inefficiencies that stem from revisiting decisions…the workarounds that get developed…the cans that get kicked down the road…because of the elephant in the room. Let’s face it: elephants aren’t meant for the office. They’re big and loud and make the place smell. None of us likes their presence. We live with them pretty regularly, though. 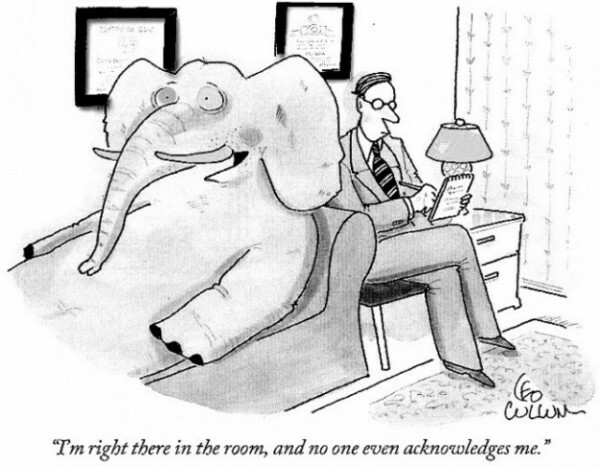 There are many reasons people choose not to acknowledge the elephant. At some point, though, the pain of not addressing an issue surpasses the pain of living with it. The frustrations and wasted time and energy become too much. Clarity – do you know what the real issue is? We often mask what’s really happening by focusing only on what we usually talk about (e.g., time, money, profits). Be careful not to make too many assumptions. Getting clear on the real issue and the real root cause is key. Conviction – for the sake of what are you committed to moving through this? Being committed to what’s on the other side of dealing with the issue helps you and others move through it. Care – how can you be compassionate regarding the tough emotions that might come up? The first sign you give that emotions aren’t ok is the last time people are willing to tackle elephants with you. It’s imperative that you acknowledge people’s responses and allow for reactions to be aired. Continuity – be careful about gearing up for the first conversation, and then ignoring the follow-through. Ensure you continue the conversations as needed until the issue has been resolved or has gained traction towards a changed reality. Courage – this is the foundation for each step above. What support do you need to be a courageous leader through this process? This may be anything from practicing aloud the opening conversations to having an objective sounding board to being well-rested and mentally clear as you raise these conversations. Which of the C’s will you struggle with the most? Isolating the variables is the first step to preparing yourself and being successful when raising these conversations. Certainly, there are many reasons people chose not to address elephants; it won’t be for everyone. Acknowledging these hidden issues, however, is a crucial part of leadership. I so often hear leaders say their main role is to remove obstacles so that the talented people who work for them can do their thing. Elephant = obstacle. Go get ‘em.